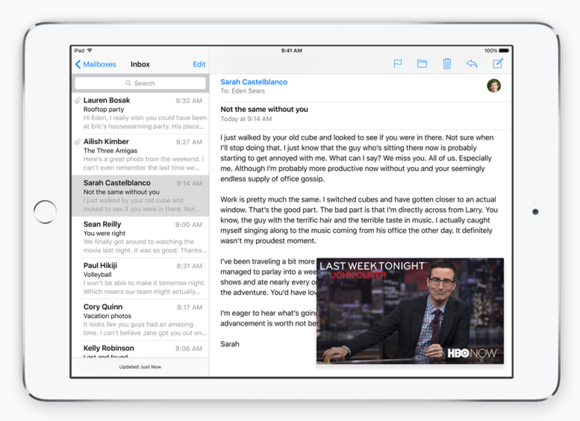 iOS 9 will make the iPad's future twice as nice. The iPad has always been a paradox. While it may have been built to fill the rather sizable gap between the iPhone and Mac, it never really embraced its own identity, playing second fiddle to each of the devices it was stuck between. Consequently, Apple’s mighty tablet has never quite been able to live up to the lofty expectations it created as the de facto leader of the post-PC revolution. But all that’s about to change. During the middle of his WWDC presentation, Craig Federighi somewhat surprisingly devoted an entire segment to the iPad, highlighting several exclusive features that power users have been clamoring for. For the first time since its launch, Apple seems to want the iPad to be a device that will truly transform the way we work. With iOS 9, Apple has refocused its attention on what the iPad is and can be, positioning it as a powerful, versatile tool that seeks to redefine the role the Mac plays in Apple’s ecosystem. The biggest difference between iOS and OS X has always been multitasking. Even more than how they handle files and apps, Macs run circles around iPads when it comes to doing more than one thing at once, deftly letting us surf the web while writing, or watch a video while clearing out our inboxes. iOS 9 doesn’t quite bring desktop-level multitasking to our iPads, at least not yet, but Apple has finally devised a way to let us run two apps simultaneously. And in true Cupertino fashion, it’s an elegant, sophisticated solution. 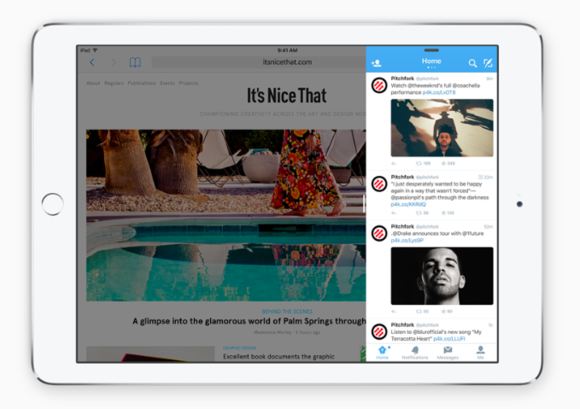 Split View is just what it sounds like: two apps, one screen. It's also iPad Air 2 only, at least for now. The most obvious implementation for tablet multitasking—-and one that has is already utilized on the Samsung Galaxy Tab—-has always been to simply split the screen down the center to allow two apps to run side by side. And while Apple did adopt what it’s calling Split View for the iPad Air 2, it also understood that the method isn’t ideal for all uses. In fact, it’s probably the aspect of multitasking most people are likely to use the least. More often than not I’m not specifically looking to run two apps together; rather I just want to grab a quick piece of information from an email or quickly look up something on the web, and I don’t need to keep the second app visible for very long. Slide Over lets you stash an app in a sidebar and pull it out when you need it, keeping another app full-screen the rest of the time. That’s where Slide Over comes in. Like the Notification Center on OS X, it can be activated by swiping from from the right side of the screen, bringing up a skinny version of an app operating in its own window. It’s a perfect way to respond to a message or quickly copy a bit of text into a note without needing to divert too much attention away from the main app you’re working in. Picture in Picture will be a godsend when you just want to entertain yourself while bushwacking through your inbox. But the most exciting piece of the iPad’s new multitasking options is Picture In Picture. If you’re watching a video or making a FaceTime call, you can shrink it and move it around just as you would a QuickTime window on your Mac—-except it’s smart enough to resize itself and always stays as the topmost window so it won’t get lost under another app. It’s the first feature to break free from the full-screen mold, and it has the potential to fundamentally change iOS almost as much as Siri has. Had I not seen it on the WWDC stage, the iPad’s multitasking options–most notably Picture in Picture–would seem like someone’s fantastical iOS concept video, a brilliant idea that just wouldn’t be possible in reality. But much like the Siri demo opened our eyes to how voice control could eventually take over navigation and dictation, it’s not hard to imagine a future incarnation where a notepad or calculator could offer the same floating functionality, elevating the iPad to new heights of productivity. It’s the closest thing to desktop multitasking that I’ve seen on a tablet and it portends as bright a future for the iPad as it’s ever had. If the generations-old A7 chip can already handle playing continuous video while jumping in and out of apps, future generations will be able to handle a far greater load, bringing us ever closer to the day where we can choose between full-screen and floating apps, just like on our Macs. And once that happens, we won’t need a hybrid machine like the Surface; the iPad will be powerful and capable enough to handle all of our day-to-day computing needs, reserving our Macs for more processor intensive tasks like Photoshop or Final Cut. The keyboard is one of the greatest multitasking tools we have on our Macs, letting us switch apps and find hidden documents with just a few strokes. 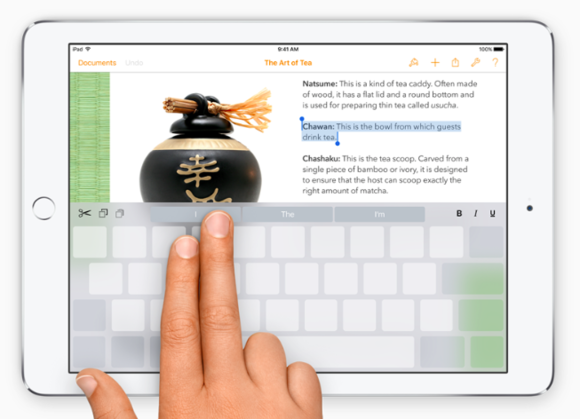 But even with iOS 8’s QuickType and third-party keyboards, the iPad keyboard isn’t an asset to productivity. Keyboards like Fleksy and Swype that are built to input text faster with one finger aren’t helpful on the larger screen, and with the exception of some clever in-app implementations, I haven’t found any that are helpful when navigating or selecting text. The QuickType keyboard in iOS 9 has shortcut buttons on either side of its toolbar, and they can change based on the app. It’s an area where the multitouch can offer an advantage. Efficiency on our MacBooks is about doing as much as we can without lifting our hands off of the keyboard, and Apple is finally bringing that mentality to the iPad. 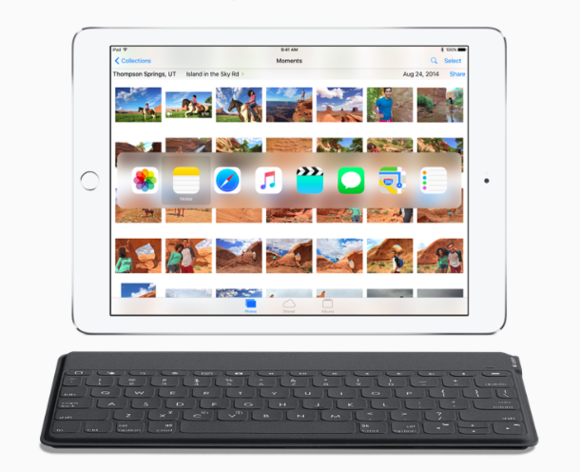 iOS 9’s new iPad keyboard opens the whole system up to faster productivity with a series of shortcuts that flank the predictive text options. Along with the shortcut buttons, the keyboard can also double as a trackpad so you don’t have to fumble with the text selection handles. And if you use a Bluetooth keyboard there are OS X-like keystroke shortcuts for quick app-switching and searching. Even cooler, you can place two fingers on the keyboard, and it'll act like a trackpad, letting you more easily select words. 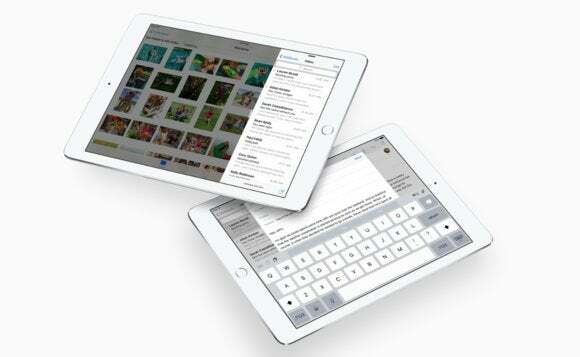 By bringing quick keys and a virtual trackpad, Apple is finally letting the iPad rub elbows with the Mac, giving us a way to navigate text, access files and browse photos with ease. The iPad’s QuickType refinements aren’t just about freeing our fingers–they elevate Apple’s tablet to a whole new level of productivity and efficiency, and open up the platform for even bigger changes. We’ve been reading about rumors of the iPad Pro for years, but multitasking has always been the highest hurdle Apple had to clear before it could become a reality. Using a MacBook-sized screen without any way to run more than one app at a time is a non-starter, and the idea of a 12-inch iPad always seemed like too much screen for this incarnation of iOS. But iOS 9 is the first clue from Apple that it’s beginning to think big. With better multitasking, quick app switching, and better support for shortcuts when using Bluetooth speakers, iOS 9 will make the iPad feel more Mac-like than ever. The multitasking system it devised is clearly built for larger screens. While we could certainly see the iPhone 6S Plus take advantage of Slide Over and maybe even Picture in Picture, Apple has so far reserved its Split Screen mode for the iPad Air 2, where it has room to breathe. And with an even bigger screen, Apple’s iOS multitasking could be an absolute thing of beauty, perhaps even letting us run up to four apps in quadrants and taking advantage of its inevitable Force Touch technology to quickly switch between screens and views. 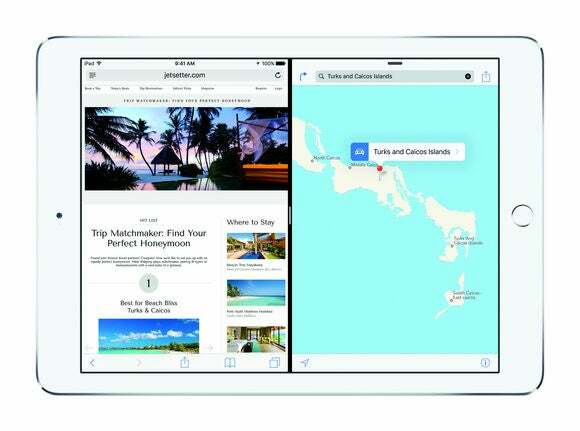 Apple has opened up a world of potential with iOS 9, not just for the iPad but for the apps that run on it. With the iPad emerging as a true post-PC device, we’ll begin to approach what we do on it differently too. Tasks that weren’t natural before will become commonplace as developers explore ways to use the Slide Out, Split View, and Picture in Picture to their advantage. The main purpose of the iPad was always to allow for iPhone developers to super-size their apps in terms of size and scale, with extra functionality and smarter interfaces that redefine our expectations of a mobile app. iOS 9 challenges that convention even more, shifting the iPad experience closer to the Mac and letting the tablet finally step out of the iPhone’s shadow. It’s not just about running two or even three apps at the same time. It’s about doing more than we ever dreamed possible on a multitouch device.